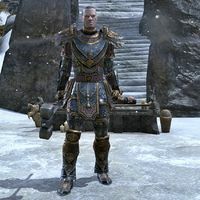 Fildgor Orcthane, formerly known as Fildgor Strong-Prince, is a Nord Thundermaul and the exiled twin brother of Jorunn the Skald-King. Backed by an army of Orcs and Stormfists, he has returned to Skyrim in a campaign to overthrow Jorunn. He is found in Sovngarde at Skuldafn, where he desecrates the body of his sister, Queen Nurnhilde, to be accepted by the Crown of Freydis. This page was last modified on 7 January 2019, at 20:03.